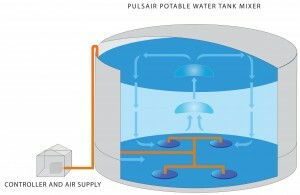 The Pulsair water storage tank mixers work by producing sequentially timed pulses of clean compressed air to generate large bubbles at the tank bottom. The rising bubbles create an immediate vertical circulation pattern that gently stirs and blends 100% of the water in the tank in a matter of minutes. The Pulsair water tank mixing process is the fastest and most energy efficient because it uses gravity to do the work of the mixing. The only energy consumed is during the process of compressing the air. Once the bubbles are released at the tank bottom, no more energy is consumed. The water in the tank continues to move long after that bubbles reach the water surface. The compressed air is released from round stainless steel plates placed on the floor of the tank. The diameter of the tank determines the number of accumulator plates (pulse points). Air supply lines are plumbed into to these plates from the compressed air source. The air compressor, air receiver and Pulsair controller are located outside the tank and can easily be accessed for scheduled maintenance. There is ZERO in-tank maintenance required with this system. 4. Absolutely ZERO in-tank maintenance with Pulsair. 1. 20-year warranty for in-tank stainless steel NSF components – no moving parts or submersible electric motors. 2. Pure medical grade air – 100% oilless scroll compressor system producing ISO 8573-1:2010 Class O for oil free content. 5. Pulsair controller can be turned on or off remotely with external timer or external PLC control system tied to electrical supply. 6. Adjustable mixing settings to meet the changing demands of the mixing including ice prevention in the winter and uniform mixing in the summer. 8. Onsite startup, installation drawings & instructions and operating & maintenance instructions.